What do you get when you combine a Blood Moon, Supermoon, the Harvest Moon, AND sunset? 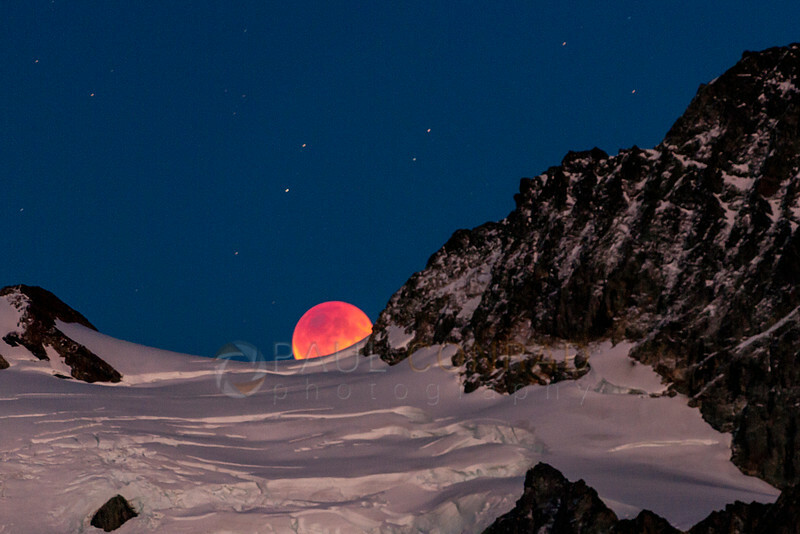 I went with a few friends to Artist Point to photograph the lunar eclipse as it rose over Mount Shuksan. Cheryl, Carol, and I went to meet local Bellingham photographer Mark Turner of Turner Photographics to walk out to Huntoon Point. At Huntoon Point, there is an unnamed pond which has great reflections of Mount Shuksan. I’ve not really shot anything there, but it was new to me. To get a really good reflection, I reversed the column on my tripod and shot it upside down about 3 inches from the water. All photos shot with my Nikon D300s. My gear listing is at the end. 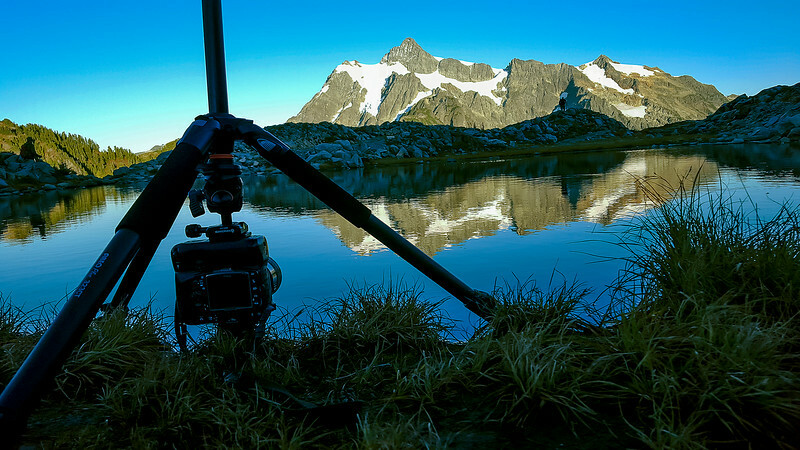 © Paul Conrad/Paul Conrad Photography – A photographer sets up for the lunar eclipse as the setting Sun ignites Mount Shuksan in its red hues as seen from Huntoon Point. Lens was 17-35 set to 17mm. Exposure: 1/15th at f/22, WB manual set to Daylight, ISO 200. Camera timer set to 2 seconds, and delayed shutter opening to lower vibration. Mount Shuksan is in the Cascade Mountains in the Mt. Baker-Snoqulamie National Forest of northern Washington. It is one of my favorite mountains due to its rugged beauty. © Paul Conrad/Pablo Conrad Photography – My camera at Huntoon Point. Flipped the column so I could get it as low as possible to capture as much of the reflection as possible. Photo from my Samsung Galaxy S6. With my gear hanging precariously from the tripod head, I shot the reflection as the Sun began setting. The view was stunning. The alpenglow was fantastic!!! I’ve been here before, but the clouds and smoke prevented me from shooting any reflections. 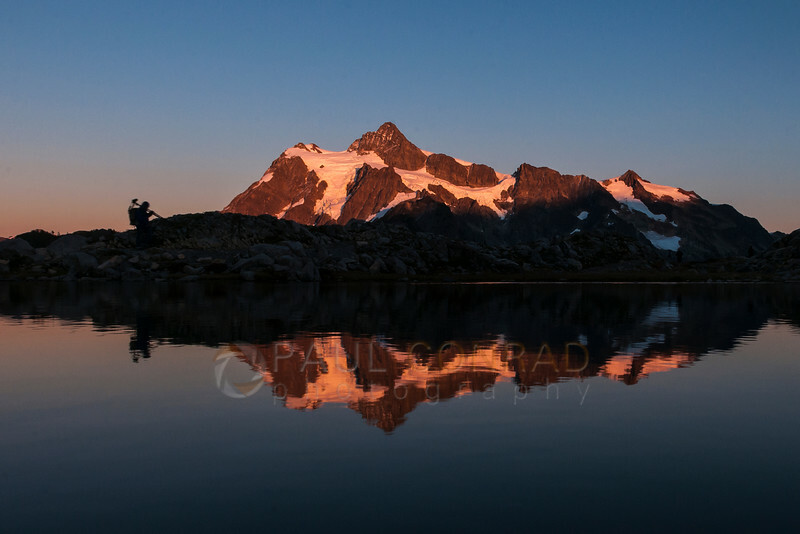 © Paul Conrad/Paul Conrad Photography – The last rays of the setting Sun bathe Mount Shuksan as its reflected in a pond Huntoon Point. Lens was my 17-35 set to 17. Exposure was 1/8th second at f/22. White Balance set to daylight, ISO at 200. This evening, we were truly blessed with crisp, clear skies, and an amazing sunset that colored the mountain so beautifully. As we were waiting, a trumpeter started playing music on the ridge opposite of Shuksan. I had already flipped my camera up and moved it away from the shore and switched to my telephoto, so it was pretty easy to swing it around to capture this sight: the musician against the sky hued from the setting Sun. 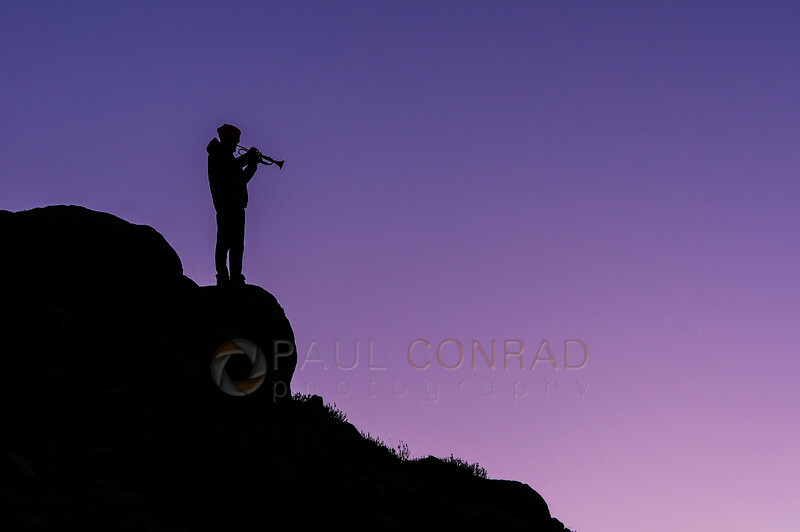 © Paul Conrad/Paul Conrad Photography – A trumpeter plays as the Sun sets during a lunar eclipse over Mount Shuksan. Tripod mounted Nikon D300s with my 70-200 lens set to about 150. Exposure was 1/6th at f/4, ISO 200, WB set to Daylight. As the Moon began to rise over Mount Shuksan, you could barely see it. It was quite dark, like blood. However, the brightness of the Moon compared with Shuksan was equal. It made the exposure quite easy. The resulting photo was well exposed with little contrast and made for minimal post-processing. 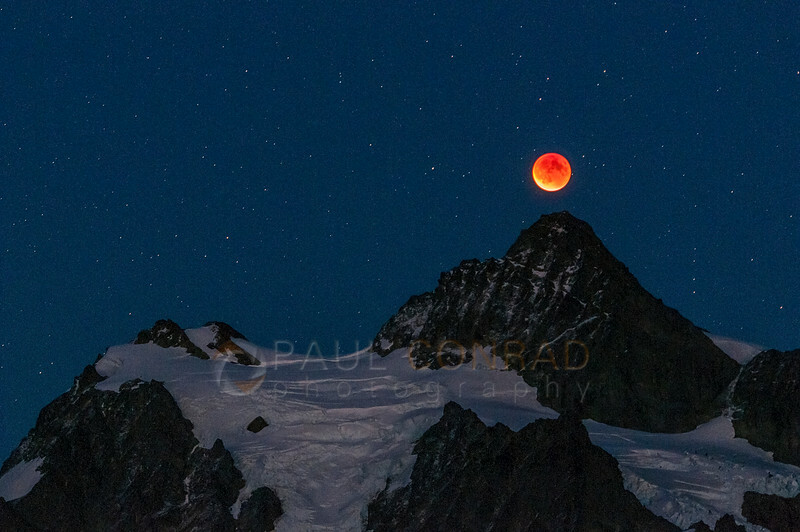 © Paul Conrad/Paul Conrad Photography – The full Blood Moon begins to rise over Mount Shuksan. The brightness of the Moon and the mountain were equal making exposure fairly easy. Lens was 70-200 zoomed to 200, Exposure was f/4 at 4 seconds (notice the slight star trails), WB set to Daylight, and a slight crop in. The red is a result of the rays from the sun being bent by Earth’s atmosphere. It’s the same reason that sunsets are red. The red light rays bend more than the blue. 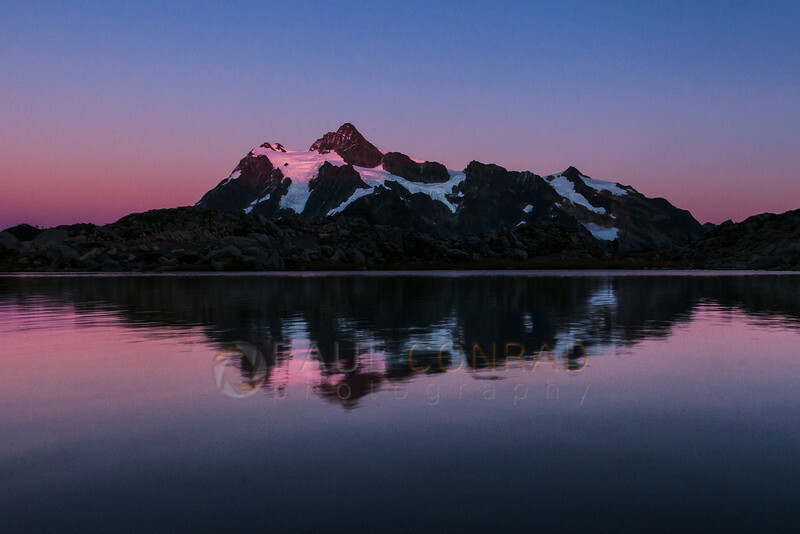 As the Moon rose in the sky, the alpenglow on Shuksan faded forcing me to up my ISO to 800. This was so I could use a fast enough shutter speed to keep the Moon from blurring due to movement. © Paul Conrad/Paul Conrad Photography – The Moon begins moving out of Earth’s shadow as it continues to rise over Mount Shuksan. The alpenglow on the mountain was gone and to keep the movement of the Moon to a minimum, I had to increase my ISO to 800. It introduced a little grain, but it was easily removed via noise reduction in Adobe Camera Raw. My 70-200 zoom lens set to about 100mm, aperture at f/2.8 and shutter at 4 seconds, WB still at Daylight. As the Moon rose over the peak, I zoomed out as I liked the composition better. It gave a sense of place and just looked better as the peak was now pointing at the Moon. And one think I don’t like about 99% of moon photos, especially eclipse, they’re just a photo of the moon without any setting. Boring if you ask me. ***TIP: To keep the Moon as natural looking as possible, I set my white balance to manual on the “Daylight” setting. This keeps the Moon Natural, however, it adds a touch of blue to the landscape. The blue doesn’t bother me and adds to the overall photo. As soon as maximum was over and the Moon was coming out of Earth’s shadow, it was pretty much time to go. The contrast between the Moon and surrounding mountains was too great to capture. It just resulted in a blown out Moon and barely visible surroundings. Also, my exposure was kept to below 4 seconds so the movement of the stars was minimal. I used my ISO to keep it that way. Mark, Cheryl, Carol, and I packed up and headed back to the car. I was not fully aware of the images I caught until I arrived home and downloaded them. As a rule, I don’t judge images from the back of the camera. My Vanguard Abeo Plus 323CT tripod. The gear was placed in an old Lowe Pro fanny pack that fits nicely into my Camelbak hiking pack. I also brought along my regular hiking gear, protein bars, a sandwich, and the bladder full of water. Forgot my coffee though, I was bummed. 8×12 and larger Canvas and Metal prints available from my website at Paul Conrad Photography. Or email me at paulconradphotography@gmail.com to ask me question about ordering.Don’t forget to sign up for email updates with tips and tricks to improve your photography.